I have always found it difficult to see rhythm in a picture as to me it is a musical term. My thoughts started with an image of a rhythmic beat from the blip of a heart monitor and progressed to the shape of sound waves. From there I moved to the shape of the ribbons in rhythmic gymnastics which brought me to my source of inspiration, namely curves in architecture! I created a series of print blocks based on photographs of curved architecture to produce my feature fabrics, using fabric paints and MX dyes. The plain contrast is also hand dyed. 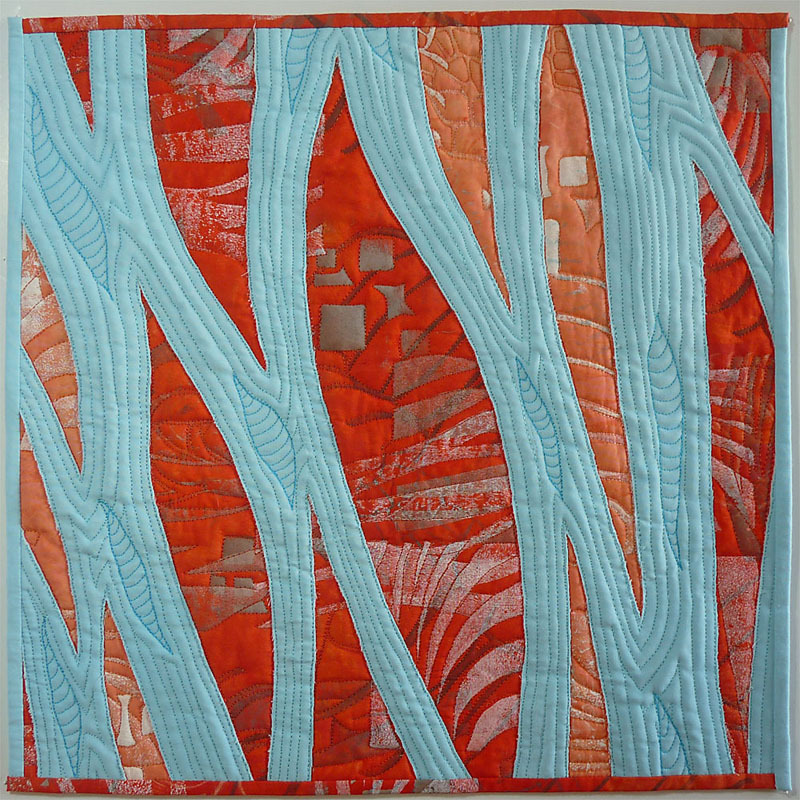 I opted to use the vibrant complementary colours of orange and turquoise (my favourite colours) as these feel full of life and at some point in my thought process I had visualized the Carnival in Rio with all its “joie de vivre”. 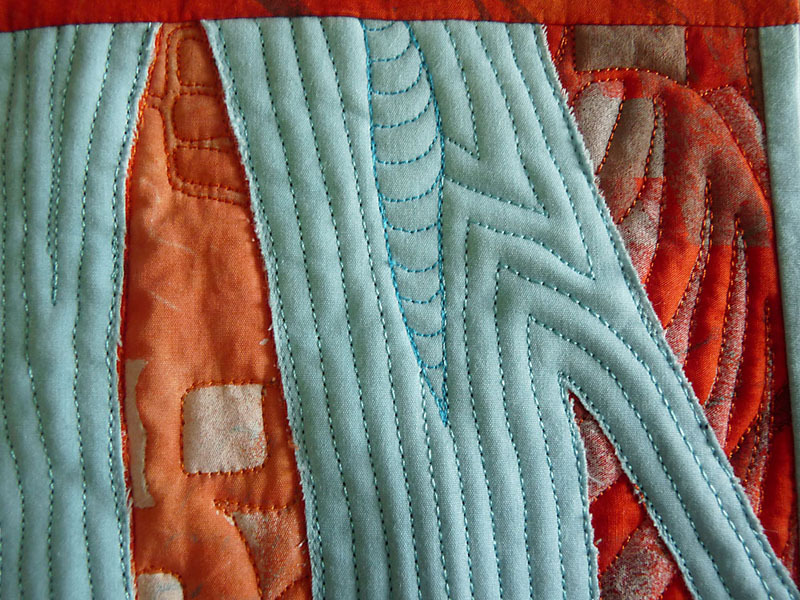 The quilt is actually a machine reverse applique with free motion stitching. 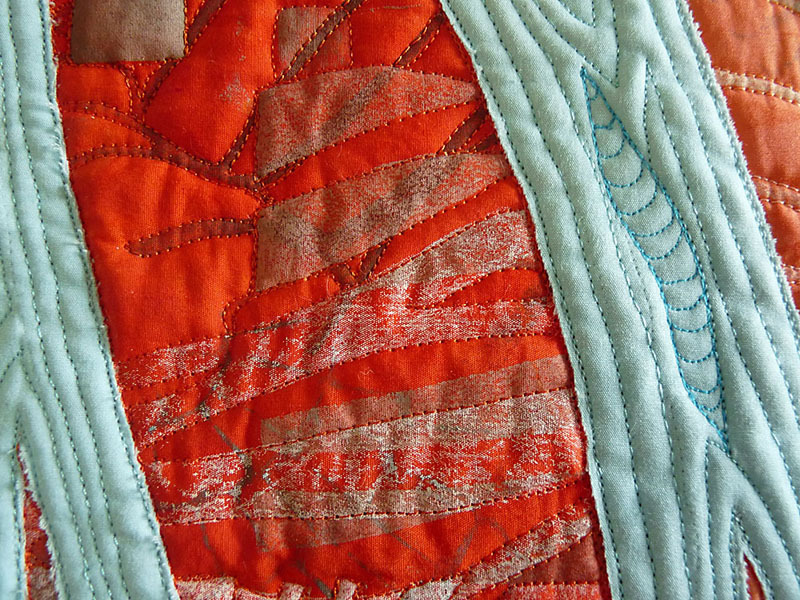 I opted to bind it to give it a frame but used both the dark orange and turquoise fabrics to create a staggered edge. Although at times I struggled with this quilt and am not really sure how I arrived at the final piece I am reasonably happy with the result. It wasn’t named though until almost finished when my son said it reminded him of blood vessels which brought me back to the heart monitor and the rhythm of life! I really like this Gaye, the fabrics you printed are great. I love your printed background Gaye. The whole piece stands out. Beautiful! I really like how the printing on the background echoes the shape of the blue ‘architecture’ or ‘arteries’. The whole piece has a lovely movement to it.